Movies to look forward to in March – AiPT! March will see a slew of interesting movies released. 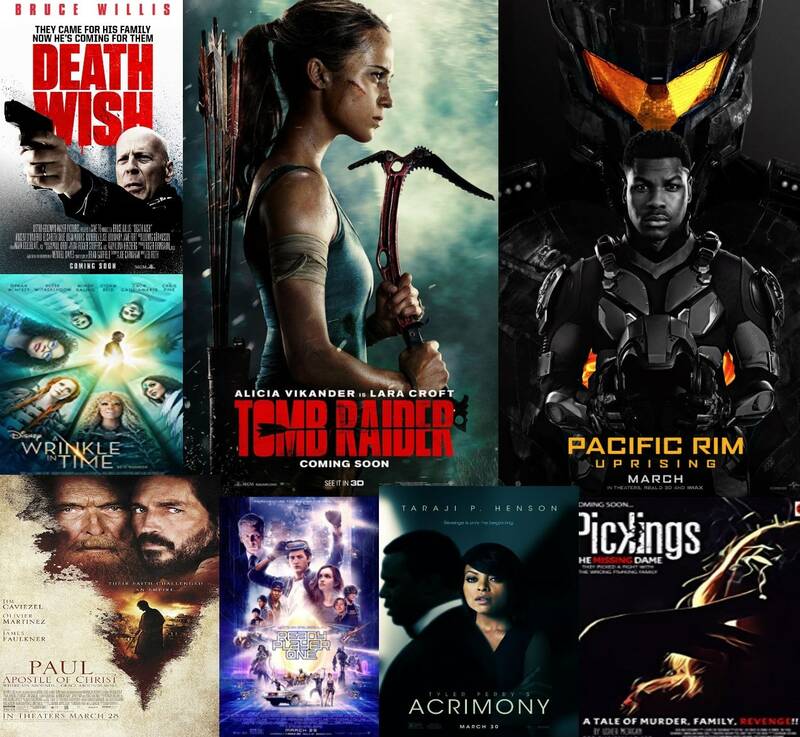 There comes a time each year when a movie fan throws up their hands and says, “There is just so much to watch!” After two months of Oscar nominees andBlack Panther, March will see a slew of interesting movies released. Red Sparrow (Nationwide): Following the surprisingly harsh reception she received for mother!, Jennifer Lawrence stars in what looks to be a more serious version of Atomic Blonde. Lawrence is a good actress and spy movies can be exciting when in the right hands. A Wrinkle in Time (Nationwide): Based on the popular young adult classic and with an ensemble cast that includes Oprah Winfrey, Reese Witherspoon, and Chris Pine, this Disney Production should be the one that ends Black Panther‘s reign at the top of the box office. Tomb Raider (Nationwide): After the successful reboot of the Tomb Raider video game series, it was only a matter of time before the movies received the same treatment. Academy Award winner Alicia Vikander stars as Lara Croft. Pacific Rim: Uprising (Nationwide): Pacific Rim was a pleasant surprise when it was released in 2013. Uprising has expectations that the original did not have and therefore has a greater chance to disappoint. The first movie was released the same time as Grown Ups 2 and Despicable Me 2 and the box office suffered domestically. Uprising may suffer the same fate. I Kill Giants (Limited): Marvel and DC are not the only comic book companies releasing movies this year. Starring Madison Wolfe and Zoe Saldana, I Kill Giants is based on the award winning 2008 Image Comics limited series about a young Dungeons & Dragons fan and how she copes with the real world. Ready Player One (Nationwide): The book was so awful it made me excited to see the movie. It was so poorly written and executed, and was ultimately a pain to read. Steven Spielberg is a great director and, in all likelihood, will make it watchable. The question is, will he be able to make it good? March is usually the month Hollywood wakes up from its holiday hangover and this year is no different. Death Wish, The Strangers: Prey at Night, Sherlock Gnomes, and Acrimony are just a few of the other movies coming out. There is a something for every movie fan in March.